The main chemical composition of Sonoran propolis (SP), as well as its antiproliferative activity on cancer cells via apoptosis induction has been reported1. Additionally, the chemical constitution of SP remained qualitatively similar throughout the year, whereas the antiproliferative effect exhibited significant differences amongst seasonal samples2. The goal of this study was to authenticate the botanical source of SP bioactivity by using an approach based on a chemical comparative analysis, antiproliferative activity and cell cycle progression analysis on cancer cell lines. The polyphenolic profile of SP throughout the year resulted to be qualitatively similar to that of Populus fremontii resins (PFR). However, the antiproliferative activity of PFR did not consistently match that exhibited by SP. In addition, SP induced evident morphological modifications (elongation) on treated cells, different to those induced by PFR. Most of cancer cells treated with SP were arrested in G2/M checkpoint (M12.C3.F6: 94.8±1.7 %, and HeLa cells: 70.8±5.7 %), similarly as colchicine did (control drug; 2 µM; 94.8±2.3 % and 72.7±6.4 %, respectively). In contrast, PFR treatment increased cell population at G0/G1 on both M12.C3.F6 (56.9±5.0 %) and HeLa cells (70.3±0.3 %), in comparison with dissolvent control. Interestingly, Ambrosia confertiflora resins induced morphological elongation and cell cycle arrest at G2/M on both M12.C3.F6 and HeLa cells, similarly as SP did. These results suggest that P. fremontii is the main plant origin of SP, nevertheless, A. confertiflora resins participate as a complementary source that enhances its bioactivity. Therefore, SP is a poplar-type propolis from subtropical semi-arid zones. 1. Alday E, Valencia D, Carreсo AL, Picerno P, Piccinelli AL, Rastrelli L, Robles-Zepeda R, Hernandez J, Velazquez C (2015) Apoptotic induction by pinobanksin and some of its ester derivatives from Sonoran propolis in a B-cell lymphoma cell line. Chemico-Biological Interactions 242: 35–44. 2.Valencia D, Alday E, Robles-Zepeda R, Garibay-Escobar A, Galvez-Ruiz JC, Salas-Reyes M, Jimйnez-Estrada M, Velazquez-Contreras E, Hernandez J, Velazquez C (2012). Seasonal effect on chemical composition and biological activities of Sonoran propolis. Food Chemistry 131: 645–651. ISNAD ALDAY, Efrain , URIBE, Lucía , VALENCIA, Dora , GARIBAY-ESCOBAR, Adriana , PICCINELLI, Anna Lisa , RASTRELLI, Luca , ASTIAZARÁN-GARCÍA, Humberto , ROBLES-ZEPEDA, Ramón Enrique , HERNANDEZ, Javier , VELAZQUEZ, Carlos . "Plant Origin Authentication of Sonoran Propolis and its Antiproliferative Effect on Cancer Cells: A Bioactive Poplar Type Propolis from Semi-arid Zones". 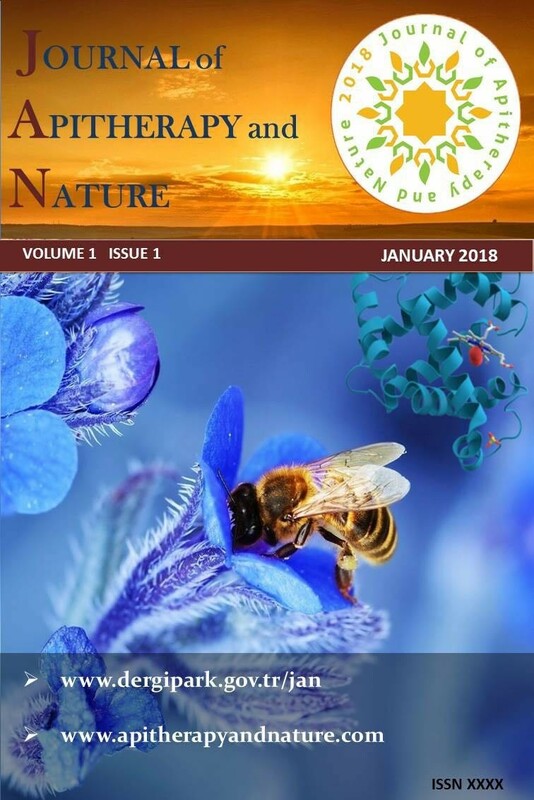 Journal of Apitherapy and Nature 1 / 3 (December 2018): 15-15.